Today we visited the Bodleian Library at Oxford. The place has so much history, it's really overwhelming. The first building we entered first opened as a divinity school in 1488 and has beautiful late-Gothic architecture. The guide told us that the Bodleian is the oldest public library in Britain, and the second largest (after the British Library). The library acts as a depository in that they collect a copy of everything published in Britain as well as other items. They have material in 125 different languages. 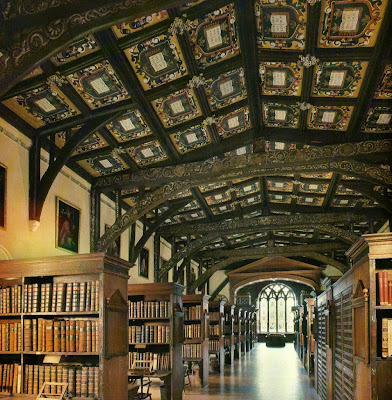 As if this weren't enough, some of the Bodleian's rooms were used in the filming of the Haarry Potter movies! But back to the history. After some of the initial book-less rooms, we were taken into Duke Humphrey's reading room, which is the oldest in the library. Many of the books here are still chained to the wall as they were in the early days of the library. On the end of each shelf was a framed shelf lists which acted as the first library catalog, describing which books were held on that shelf. The Humphrey library was also one of the first galleried libraries in Britain. By putting the stairs to the gallery by the librarian's desk, the lirbarian could monitor who went up to the shelves; this also meant that those books would not have to be chained to the wall. After the Humphrey's library were were led into underground tunnels that connect the old library to the new. The tunnels were originally used as air raid shelters, but fortunately, Oxford was never actually bombed during the war. (The guide explained to us that there is a rumor that the reason they weren't bombed is because Hitler wanted an honorary degree from Oxford.) Also in the tunnels is an old conveyor system that moves books between the libraries and is still in use. Other than the library, the trip to Oxford was fairly uneventful. We traveled there by train from Paddington Station, which was nice if only because I was always a fan of the Paddington Bear books when I was a kid. They even had a kiosk selling Paddington Bear-related merchandise, and I ended up buying a new copy of the first book in the series. Once in Oxford, I wandered around with some of my classmates, going in some of the toursity shops and checking out the town on foot. After the library tour, we hit the Alice in Wonderland Shop (which was fun, though I didn't buy anything), grabbed dinner at a nearby pub, then grabbed the train back to London.